As you all know it was Felt Day at The Eternal Maker last Saturday and here, as promised, are the results of our staff felt roll challenge.......... As expected there were a complete mixture of ideas. Although, saying that, it was not expected that we would end up with, amongst other things, a Christmas Cactus and a set of Egg Clothes! (.......yes that is clothes for eggs!). What really amazed us was how much you can actually make from one seemingly small felt roll - Millie managed to squeeze out a fully fledged tea cosy and set of coasters (more on this later)! Anyway, as promised we will be posting pictures and tutorials for you all in the coming weeks. In the end we really could not decide a winner so any feedback would be gratefully received. We hope our projects inspire you and if you have ago yourself be sure to show us the results - we love to see what everyone is up to! 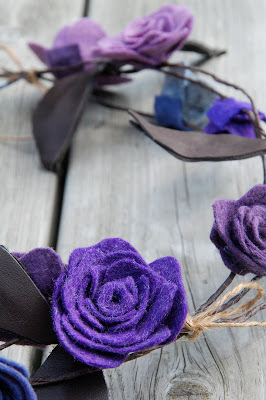 For my felt roll challenge I wanted to make something unpredictable and settled on a floral garland, perhaps not as unpredictable as I'd have hoped but I love what I ended up with all the same. Initially I wanted to make a bib style necklace with lots of roses bundled together but by the time I'd made them all I changed my mind (typical)! After raking around in my stash I decided to add a couple of additional materials into the mix. For the challenge we were allowed to use up to three additional items so I chose wire and brown floral tape for the base of the garland, and some dark brown leather for the leaves. 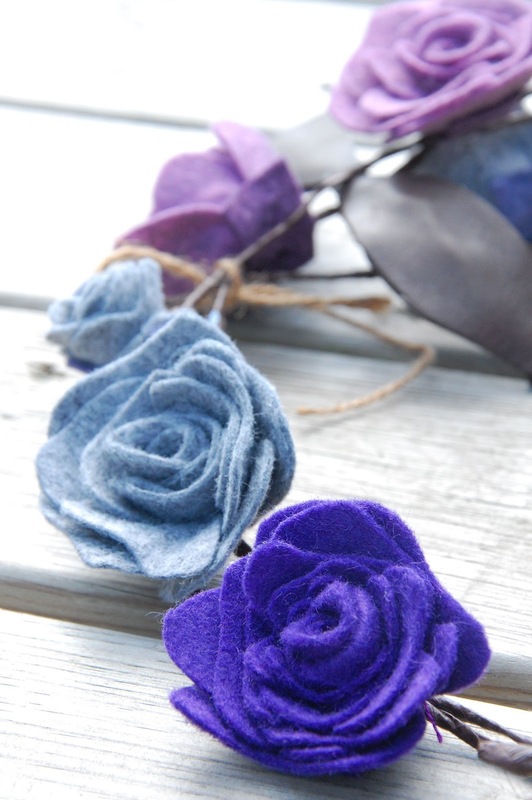 I think the purple hues from my felt roll mixed with the dark brown gave it an autumnal feel. Although it's all ravelled up on display it does unwrap to just over 7ft of lovely garland! And a bonus, it was SUPER EASY TO MAKE so I'm going to show you how to make the bigger roses and then you can create whatever wonderful crafty goodness you wish! Once you've cut all your shapes out, it's time to sew them! Begin rolling your rosebud with the skinny end in the centre, adding stitches as you go to keep it from unrolling. Once you've rolled it all the way, secure with a knot. Your rosebud should look something like this! If you like the look of it like this, leave as is or if you want it a little fuller, pull the petals out backwards towards the stitching starting from the outside working your way around until your petals don't stay put anymore! There you have it, cute little roses to add to whatever creation you like! 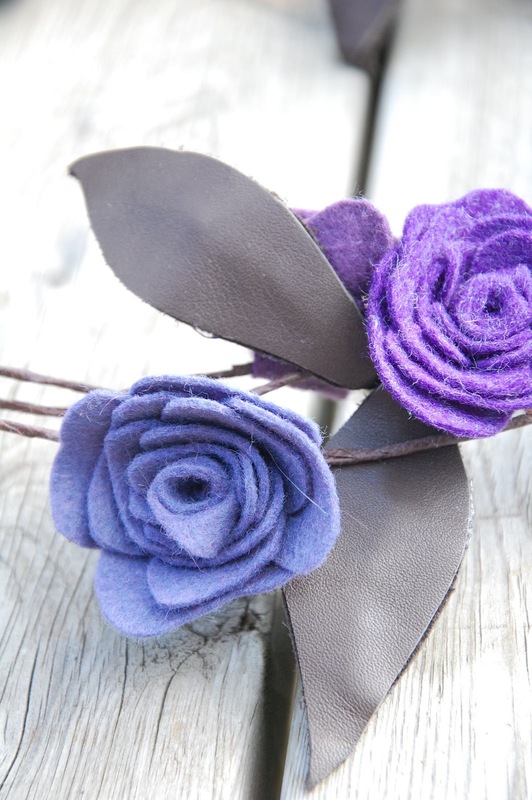 They make beautiful brooches or hair flowers, you could even create a bouquet! If you want to make a garland like mine, just measure 6ft or so of wire, wrap with floral tape and glue your roses along the wire using felt scraps as a backing. The leaves were created using scraps of leather glued to a short length of floral tape covered wire (with a leaf at either end) and simply wrapped the wire once or twice around the garland where I wanted. 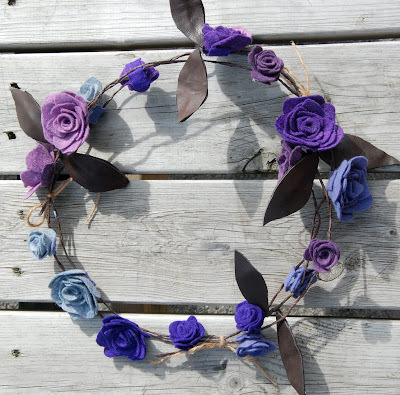 To turn it into a wreath just coil it up to a size you're happy with and tie with twine!